Adapter for MEL Card Use New Type 68 PCMCIA MEL Card in an instrument designed to use the original 50 contact MEL card. This does not include the 68 pin PCMCIA MEL card. 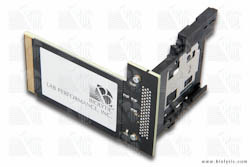 To purchase a 68 pin PCMCIA MEL Card with Version 2.01 394 / 392 software to be used with this adapter, please order part number: 483-107509.